Samsung is set to unveil a new flip phone model in China on November 9. 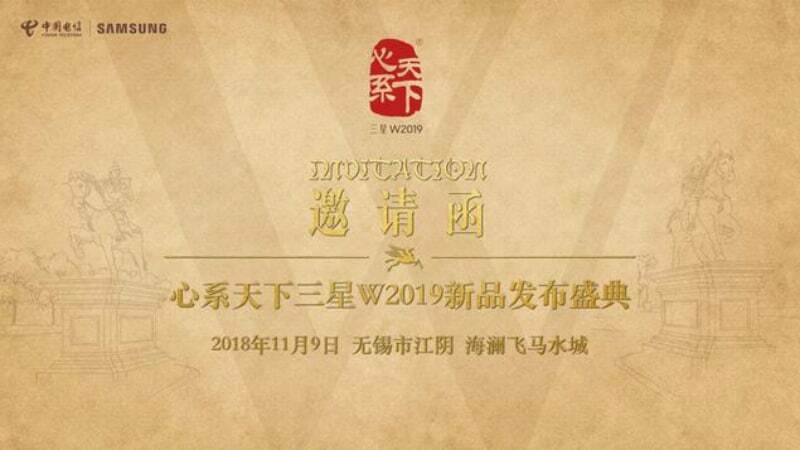 The South Korean giant has sent invites to a launch event scheduled in Wuxi, a city near Shanghai, where it will unveil the SM-W2019 as the successor to the W2018 that was launched in December last year. The W2018 featured two 4.2-inch AMOLED display panels and included a Qualcomm Snapdragon 835 SoC, coupled with 6GB of RAM. Recently, a report detailing the W2019 speculated that the smartphone could come with a Snapdragon 845 SoC. It is also claimed to be codenamed "Lykan". As per the alleged invite shared by tipster Zyad Atef, Samsung has confirmed that it is launching the W2019 flip phone in China on November 9. This new model will be the successor to the W2018 that debuted last year with two 4.2-inch full-HD (1080x1920 pixels) AMOLED display panels and a Snapdragon 835 SoC. The last year model also had 6GB of RAM, 64GB/ 256GB storage options along with microSD card support, 12-megapixel rear camera sensor along with an f/1.5 aperture, 5-megapixel sensor at the front, and a 2,300mAh battery. Folks at SamMobile speculate the Samsung W2019 will continue the legacy of having high-end specifications, including a pair of full-HD AMOLED displays and the top-end, Snapdragon 845 SoC. The device could have a dual rear camera setup along with artificial intelligence (AI) backed features including a Scene Optimiser. Further, there could be Android 8.1 Oreo at the initial stage, though the handset is likely to receive Android 9 Pie in the future. If we believe what was spotted through the kernel source code of the Galaxy S9's Snapdragon variant earlier this year, the W2019 flip phone will be powered by a Snapdragon 845 SoC. The smartphone is also said to be internally known as "Lykan" and could have a metal body. It's been two years that Samsung has been launching its flip phones in China. The first flip phone was launched by the company in November 2016 with a Snapdragon 820 SoC, while it brought the W2018 as its new clamshell design smartphone in November last year. This suggests that the new phone is launching on the date specified in the invite along with a Snapdragon 845 SoC. Details such as the price and availability of the Samsung W2019 are yet to be revealed. We may get some information at the time of the official launch next week.